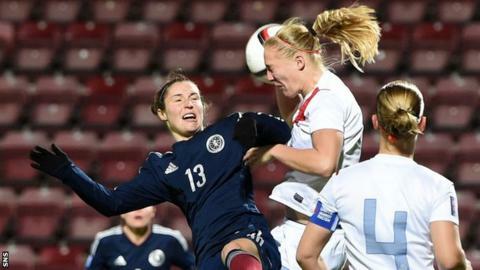 Anna Signeul believes her Scotland players can overcome the 2-1 first-leg loss in their 2015 World Cup play-off semi-final against the Netherlands. Lieke Martens put the visitors ahead and Manon Melis doubled the lead from the spot before Kim Little's penalty reduced the deficit. "We still believe in what we're doing, and we still know we can change it," said Signeul. "It'll be tough, but we can score two goals. We're not giving up so easily." Scotland were struggling early in the match when Rachel Corsie required treatment on a nosebleed following a clash of heads. "It's a strong team, Holland, but we can change this"
The numerical advantage spurred the Dutch on and Signeul's side were on the back foot in the early stages of the match, but an improved second-half performance gave Signeul confidence her players can improve in the second leg. "It was an unfortunate start, having to play with 10 players, being under so early at 2-0, wasn't a good start," said the head coach. "They couldn't get the blood to stop bleeding from Rachel's nose, so she wasn't allowed to go on. "We had a great second half gain, and came back. It's a strong team, Holland, but we can change this. "We need to start much better than we did here, and we need to go for it and score goals. Because 1-0 is not enough." The Netherlands host Scotland in Thursday's return leg in Rotterdam.